Bratislava ( or ; [ˈbracislaʋa], German: Preßburg or Pressburg [ˈpʁɛsˌbʊɐ̯k] is the capital of Slovakia, and with a population of about 450,000, the country's largest city. The greater metropolitan area is home to more than 650,000 people. Bratislava is in southwestern Slovakia, occupying both banks of the River Danube and the left bank of the River Morava. 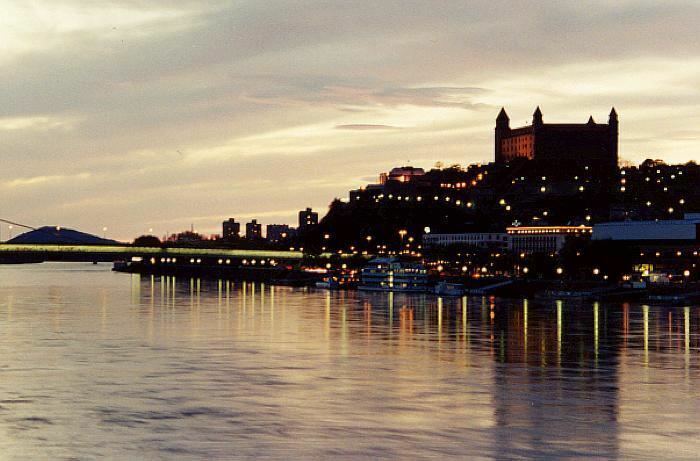 Bordering Austria and Hungary, it is the only national capital that borders two sovereign states. The history of the city has been strongly influenced by people of different nations and religions, namely by Austrians, Croats, Czechs, Germans, Hungarians, Jews, Serbs and Slovaks (in alphabetical order). The city served as the coronation site and legislative center of the Kingdom of Hungary from 1536 to 1783, and has been home to many Slovak, Hungarian and German historical figures. The capital of Slovakia is the eighth best city for freelancers to live in, mostly because of fast internet and the low taxes. In 2017, Bratislava was ranked as the third richest region of the European Union by GDP (PPP) per capita (after Hamburg and Luxembourg City). GDP at purchasing power parity is about three times higher than in other Slovak regions. The city received its contemporary name in 1919. Until then, it was mostly known in English by its German name, Pressburg, as it was long dominated by Austrians and other German-speakers. That is the term from which the pre-1919 Slovak (Prešporok) and Czech (Prešpurk) names are derived. The medieval settlement Brezalauspurc (literally: Braslav's castle) is sometimes attributed to Bratislava, but the actual location of Brezalauspurc is under scholarly debate. The city's modern name is credited to Pavel Jozef Šafárik's misinterpretation of Braslav as Bratislav in his analysis if mediaeval sources, which made him invented the term Břetislaw, which later became later Bratislav. In the 10th century, the territory of Pressburg (what would later become Pozsony county) became part of Hungary (called "the Kingdom of Hungary" from 1000). It developed as a key economic and administrative centre on the kingdom's frontier. This strategic position destined the city to be the site of frequent attacks and battles, but also brought it economic development and high political status. It was granted its first known "town privileges" in 1291 by the Hungarian King Andrew III, and was declared a free royal town in 1405 by King Sigismund. In 1436 he authorized the town to use its own coat of arms. The Kingdom of Hungary was defeated by the Ottoman Empire in the Battle of Mohács in 1526. The Turks besieged and damaged Pressburg, but failed to conquer it. Owing to Ottoman advances into Hungarian territory, the city was designated the new capital of Hungary in 1536, becoming part of the Austrian Habsburg monarchy and marking the beginning of a new era. The city became a coronation town and the seat of kings, archbishops (1543), the nobility and all major organisations and offices. Between 1536 and 1830, eleven Hungarian kings and queens were crowned at St. Martin's Cathedral. The 17th century was marked by anti-Habsburg uprisings, fighting with the Turks, floods, plagues and other disasters, which diminished the population. The city started to lose its importance under the reign of Maria Theresa's son Joseph II, especially after the crown jewels were taken to Vienna in 1783 in an attempt to strengthen the union between Austria and Hungary. Many central offices subsequently moved to Buda, followed by a large segment of the nobility. The first newspapers in Hungarian and Slovak were published here: Magyar hírmondó in 1780, and Presspurske Nowiny in 1783. In the course of the 18th century, the city became a centre for the Slovak national movement. 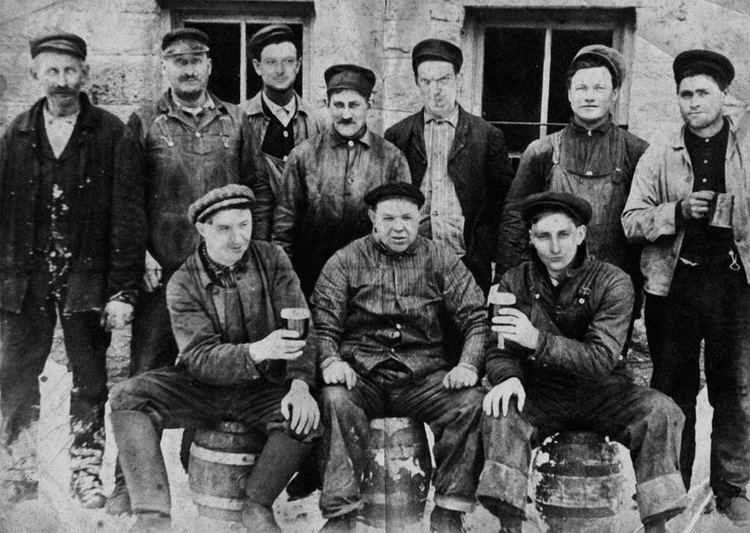 Industry developed rapidly in the 19th century. The first horse-drawn railway in the Kingdom of Hungary, from Pressburg to Szentgyörgy Svätý Jur, was built in 1840. A new line to Vienna using steam locomotives was opened in 1848, and a line to Pest in 1850. Many new industrial, financial and other institutions were founded; for example, the first bank in present-day Slovakia was founded in 1842. The city's first permanent bridge over the Danube, Starý most, was built in 1891. Before World War I, the city had a population that was 42% ethnic German, 41% Hungarian and 15% Slovak (1910 census). After World War I and the formation of Czechoslovakia on October 28, 1918, the city was incorporated into the new state despite its representatives' reluctance. The dominant Hungarian and German population tried to prevent annexation of the city to Czechoslovakia and declared it a free city. However, the Czechoslovak Legions occupied the city on January 1, 1919, and made it part of Czechoslovakia. The city became the seat of Slovakia's political organs and organizations and became Slovakia's capital on 4 February. On February 12, 1919 the German and Hungarian population started a protest against the Czechoslovak occupation, but the Czechoslovak Legions opened fire on the unarmed demonstrators. In 1993, the city became the capital of the newly formed Slovak Republic following the Velvet Divorce. In the 1990s and the early 21st century, its economy boomed due to foreign investment. The city has also hosted several important cultural and political events. Bratislava is situated in southwestern Slovakia, within the Bratislava Region. Its location on the borders with Austria and Hungary makes it the only national capital that borders between two countries. It is only 62 kilometres (38.5 mi) from the border with the Czech Republic and only 60 kilometres (37.3 mi) from the Austrian capital Vienna. From the city's origin until the 19th century, Germans were the dominant ethnic group. However, after the Austro-Hungarian Compromise of 1867, active Magyarisation took place, and by the end of World War One 40% of the population of Pressburg spoke Hungarian as their native language, 42% German, and 15% Slovak. The Bratislava Region is the wealthiest and most economically prosperous region in Slovakia, despite being the smallest by area and having the second smallest population of the eight Slovak regions. It accounts for about 26% of the Slovak GDP. The GDP per capita (PPP), valued at €54,400(~$71,000) (2015), is 188% of the EU average and is the third-highest of all regions in the EU member states. The average gross monthly salary in the Bratislava region in 2016 was €1427. The unemployment rate in Bratislava was 1.83% in December 2007. Many governmental institutions and private companies have their headquarters in Bratislava. More than 75% of Bratislava's population works in the service sector, mainly composed of trade, banking, IT, telecommunications, and tourism. The Bratislava Stock Exchange (BSSE), the organiser of the public securities market, was founded on March 15, 1991. Companies with the highest value added according to TREND TOP 200 ranking (2011), operating predominantly in Bratislava, include the Volkswagen Bratislava Plant, Slovnaft refinery (MOL), Eset (software developer), Asseco (software company), PPC Power (producer of heat and steam) and Trenkwalder personnel agency. Volkswagen Group took over and expanded the BAZ communist-built factory in 1991, and has since considerably expanded production beyond original Skoda Auto models. Currently, 68% of production is focused on SUVs: Audi Q7; VW Touareg; as well as the body and under-chassis of the Porsche Cayenne. Since 2012, production has also included Volkswagen up! and badge-engineered SEAT Mii and Skoda Citigo. 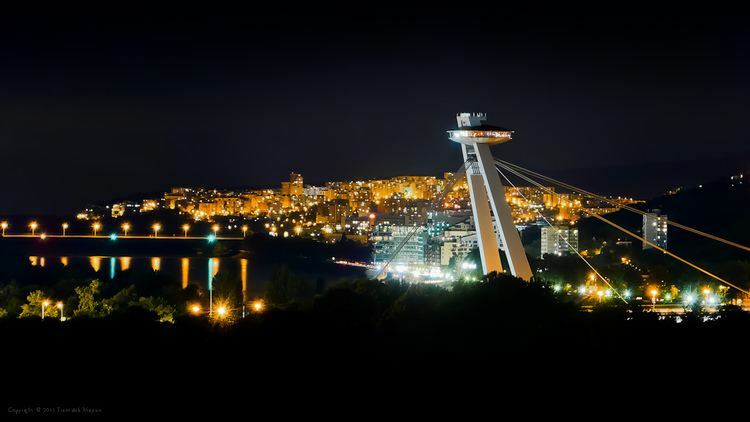 The Slovak economy's strong growth in the 2000s has led to a boom in the construction industry, and several major projects have been completed or are planned in Bratislava. Areas attracting developers include the Danube riverfront, where two major projects are already finished: River Park in the Old Town, and Eurovea near the Apollo Bridge. Other locations under development include the areas around the main railway and bus stations, around the former industrial zone near the Old Town and in the boroughs of Petržalka, Nové Mesto and Ružinov. It is expected that investors will spend €1.2 billion on new projects by 2010. The city has a balanced budget of 277 million Euros (as of 2010), with one fifth used for investment. Bratislava holds shares in 17 companies directly, for example, in the public transport company (Dopravný podnik Bratislava), the waste collection and disposal company, and the water utility. The city also manages municipal organisations such as the City Police (Mestská polícia), Bratislava City Museum and ZOO Bratislava. Among other factors, the growth of low-cost airline flights to Bratislava, led by Ryanair, has led to conspicuous stag parties, primarily from the UK. While these are a boon to the city's tourism industry, cultural differences and vandalism have led to concern by local officials. Reflecting the popularity of rowdy parties in Bratislava in the early to mid-2000s, the city was a setting in the 2004 comedy film Eurotrip, which was actually filmed in the city and suburbs of Prague, the Czech Republic. Bratislava has many shopping areas and markets throughout the city. The streets of historical Old Town are lined with shops. Bratislava has 7 major Shopping centres: Aupark, Avion Shopping Park, Bory Mall, Central, Eurovea, Polus City Center and Shopping Palace. Avion Shopping Park is the biggest shopping mall in Slovakia by area with 172 stores. Eurovea is a business, retail and residential complex located near the Apollo bridge. Eurovea connects the Danube riverbank with the city center. A month before Christmas the Main Square in Bratislava is illuminated by a Christmas tree and the Christmas market stalls are officially opened. The Bratislava Christmas Market produces a distinctive atmosphere and attracts thousands of people every day, who come to meet their friends and chat over some mulled wine and traditional specialties. Around 100 booths are opened every year. It is opened most of the day as well as in the evening hours. Bratislava is the cultural heart of Slovakia. Owing to its historical multi-cultural character, local culture is influenced by various ethnic and religious groups, including Germans, Slovaks, Hungarians, and Jews. Bratislava enjoys numerous theatres, museums, galleries, concert halls, cinemas, film clubs, and foreign cultural institutions. The Slovak National Museum (Slovenské národné múzeum), founded in 1961, has its headquarters in Bratislava on the riverfront in the Old Town, along with the Natural History Museum, which is one of its subdivisions. 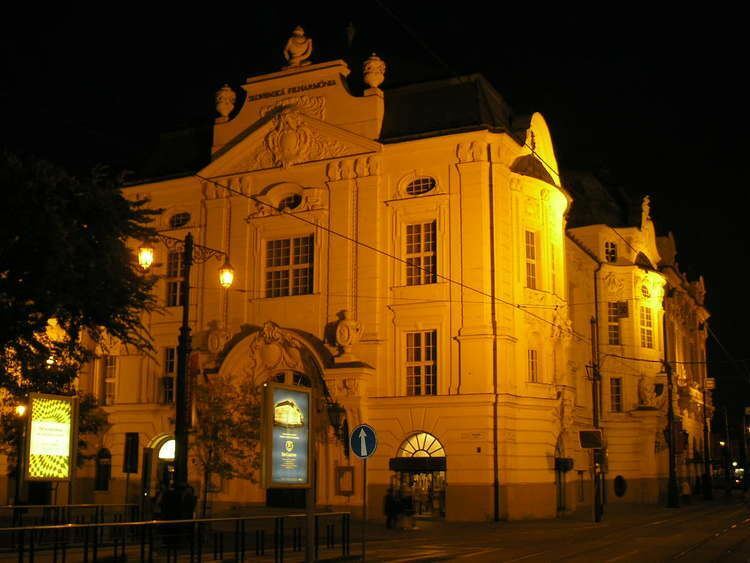 It is the largest cultural institution in Slovakia, and manages 16 specialised museums in Bratislava and beyond. The Bratislava City Museum (Múzeum mesta Bratislavy), established in 1868, is the oldest museum in continuous operation in Slovakia. Its primary goal is to chronicle Bratislava's history in various forms from the earliest periods using historical and archaeological collections. It offers permanent displays in eight specialised museums. There are 65 public primary schools, nine private primary schools and ten religious primary schools. Overall, they enroll 25,821 pupils. The city's system of secondary education (some middle schools and all high schools) consists of 39 gymnasia with 16,048 students, 37 specialized high schools with 10,373 students, and 27 vocational schools with 8,863 students (data as of 2007).